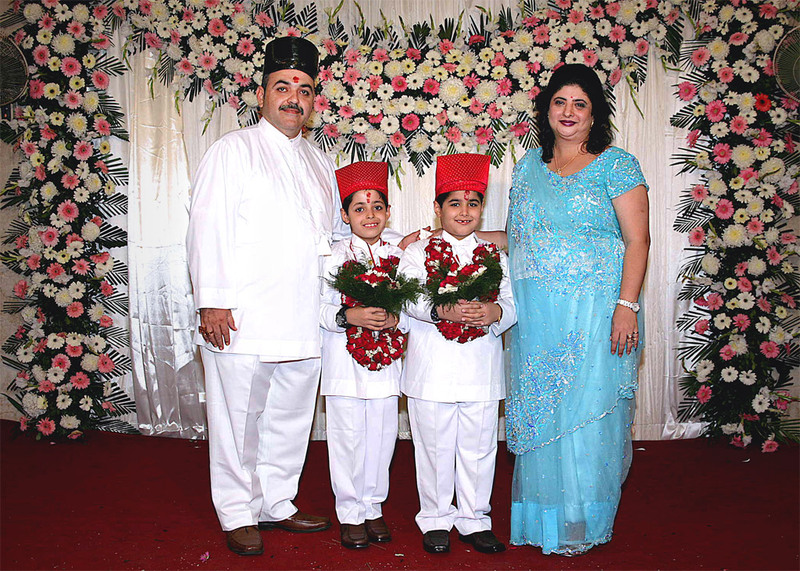 The word "Navjote" is derived from the Avesta (ancient Persian) words "Nav" meaning New and "Jote" meaning Worshipper, and the ceremony is one of initiation into the Zoroastrian faith. In medieval Persian, the ceremony was called "Naozad" or "New Birth" signifying the rebirth of the child into the religion. The ceremony, therefore, is comparable to a Christian Confirmation or a Judaic Bar Mitzvah. The form of the ceremony has not basically changed in some nine thousand years since the first Navjote was performed by the Prophet Zarathushtra when the family of King Gushtasp became the first royal initiates into the faith. The religion of Zarathushtra has been called the Religion of the Good Life, which constantly reminds us that good thoughts are good, that good words are better and that good deeds are the best, and exhorts us to actively lead the good life and follow the path of righteousness. The Navjote ceremony is preceded by the "Nahan" or the ritual bath. It is given under the supervision of a priest who had just performed the "Yasna" ceremony. The child drinks the sacramental drink and takes part in the "Patet" a prayer of repentance, asking forgiveness for any sins committed in the past or which may be commited in the future. The bath symbolically cleanses the initiate of past sins. It is believed that up to this time, any sins committed by the child are a reflection on his/her parents and that after the Navjote, the child is solely responsible for his or her own actions. The ceremony is followed by the "Achu Michu" ritual, which is of Indian origin. The immediate lady members of the family carry the "Ses" (a silver tray) holding various silver vessels containing water, an oil lamp, an egg, dry fruit, coconuts and rice. These items represent the mineral and vegetable kingdoms and symbolize four of the seven physical creations of God, namely fire, earth, water and plants. The other three are the sky, animals and man. Each one of these creations is presided over by a "Bounteous Immortal", who also represents the key attributes of God. The "Achu Michu" ritual starts with the mother of the child taking an egg in her right hand, rotating it seven times around the child's head in a clockwise manner and then breaking it near her feet. This process is repeated with a coconut and wetted rice. The clockwise rotation ensures the symbolic assimilation of the intrinsic goodness and representative qualities of the item, at the spiritual level, while at the same time drawing out any evil which may be present. The seven rotations are a remembrance of the "Bounteous Immortals". The breaking of the object ensures that any evil qualities drawn out and now contained in the item are destroyed. 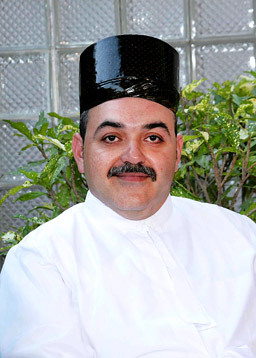 The ceremony now continues with the "Kem-na Mazda" prayer, the "Affirmation of the Faith", by the child accepting the teachings of the the Zoroastrian religion and affirming to follow the path of "Asha" (righteousness) as laid down by Ahura Mazda, "praised be the most righteous, the wisest, the most holy and the best Mazdayasnian law, which is the gift of Mazda. The good, true and perfect religion which God has sent to this world, is that which Zarathushtra has brought. That religion is the religion of Zarathushtra, the religion of Ahura Mazda communicated to holy Zarathushtra". This affirmation, as all other Zoroastrian prayers, closes with the "Ashem Vohu" a prayer praising righteousness, "eternal happiness to him who practices righteousness for the sake of righteousness". The child is now invested with the "Sudreh". The "Sudreh" is a V-necked shirt made from white muslin, and consists of two pieces, the front and the back, stitched together at the sides, symbolizing the past and the future joined through the present. At the base of the neck is a small pocket, the "purse of righteousness", reminding the wearer that the pocket must be filled with good deeds to make him worthy of heaven. The ceremony continues with the "Nirang-e Kushti-Bastan" prayer during which the "Kushti" or sacred thread will be tied around the child's waist. The "Kushti" is a consecrated, hand woven string of lamb's wool and consists of seventy-two threads, one for each chapter of the text of the "Yasna" ritual. The child prays "The Omniscient God is the greatest Lord, Ahriman is the evil spirit that keeps back and deters the advancement of the world. May that evil spirit with all his accomplices remain fallen and dejected, Oh Omniscient Lord. I repent of all my sins, I repent of all the evil thoughts that I may have entertained in my mind, all the evil words I may have spoken, of all the evil deeds that I may have done. I vow to follow the precepts of Ahura Mazda as taught through Lord Zarathushtra, to have good thoughts, to say good words, and to perform good deeds". The "Kushti" is now wrapped around the waist three times and is tied by simple knots in the front and back while praying the "Ahunavar" and the "Ashem Vohu" prayers. The wearing of the "Sudreh" and "Kushti" with the recital of the religious formulae are held to be symbolic of Obedience to God, closing the door on evil and against sin, and breaking the power of destruction. "Oh Almighty God come to my aid. I am a worshiper of God. I am a Zoroastrian worshiper of God. I agree to praise the Zoroastrian religion and to believe in that religion. I praise good thoughts, good words and good deeds. "Grant me, O Ahura, in Thy ranks to stand – A valiant soldier – faithful to the end!" The Navjote concludes with the officiating priest welcoming the child into the religion and praying the "Tandarosti" asking for God's blessings to be bestowed upon the child. "May you enjoy health, long life and the splendor of piety. May the good Angels and the Bounteous Immortals come eternally to your help. May the religion of Zarathushtra flourish. May this child live long to help the virtuous. May this day be auspicious, this month be auspicious, and this year be auspicious. May you live for a thousand years to lead a holy, charitable and religious life. May you perform righteous deeds. May health, virtue and goodness be your lot. May all your good wishes be fulfilled like those of the immortal angels.